Back into the groove we go with today’s biggie, the amazing sounds of a house music pioneer, Inner City’s Kevin Saunderson. With Inner City, or on his own, Kevin has been behind some of dance music biggest tracks, best compilations and some top albums. Here though, it’s his classic ‘The Sound’, from 1987 (!) 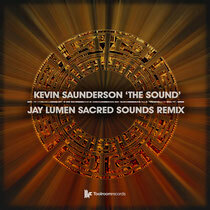 that gets brought bang up to date by Jay Lumen with his Sacred Sounds remix. It’s hard to believe the original of this is 25-years old, as it still sounds so damn good. Thankfully though, Hungary-based Jay’s remix will make sure that there’s still years of support and fondness for the track going forward as he adds his own distinct flavour to it. It's over two and half minutes into the track before the huge recognisable hook kicks in, but when it does, you know you’ve just dropped something magical. It’s out now, check it out below.